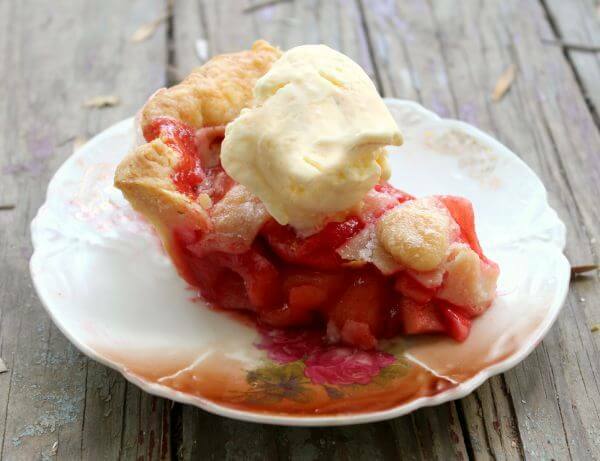 This old fashioned strawberry rhubarb pie recipe is a delicious combination of sweet and tangy. The filling is a gorgeous bright crimson color surrounded by flaky, golden-brown, buttery pastry. If it was possible to take a bite of a country summer’s day this would be it! 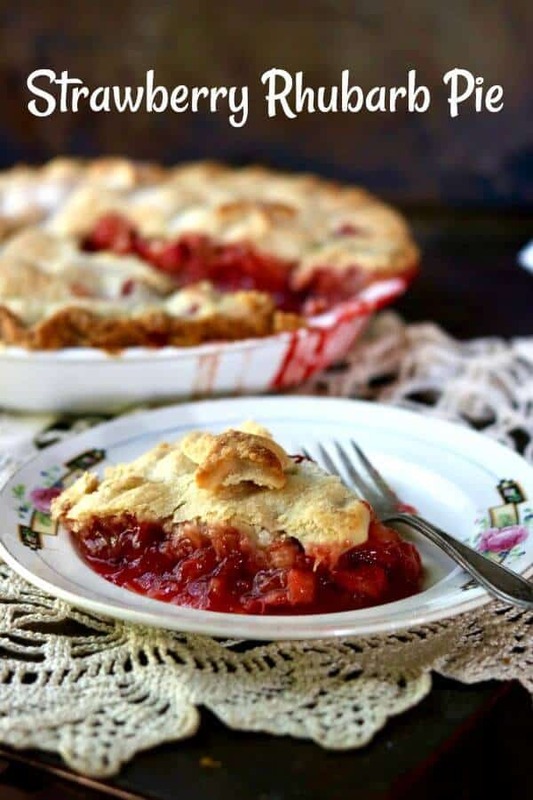 I am told that when I was two I had my first bite of strawberry rhubarb pie, a memorable concoction that my aunt created in her farmhouse kitchen with bright red strawberries still warm from her garden and home grown rhubarb from her deep freeze. Apparently my eyes got big and I dove in to the rest of the pie all hands and head. At this point in my life there is no one to confirm nor deny the story so I’ll just assume it is true. 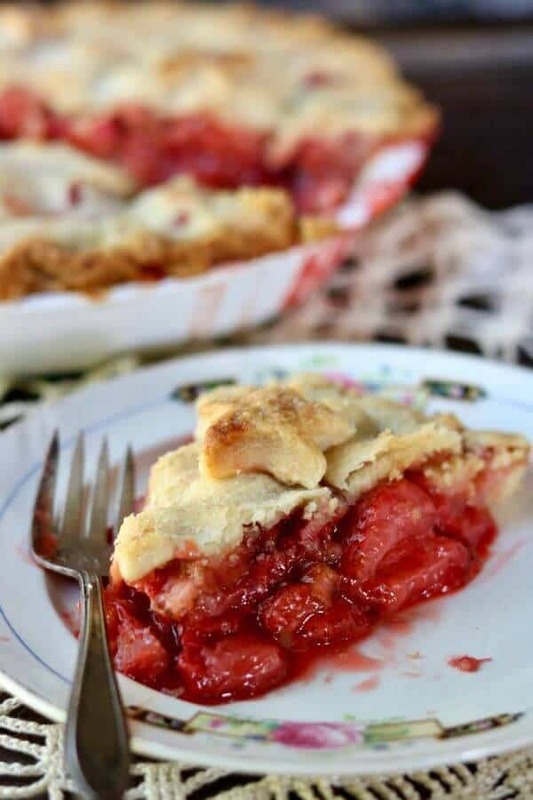 It wouldn’t surprise me – there’s just something about the sweet-tangy combination in strawberry rhubarb pie that dances the ChaCha across your tongue before the rich, buttery pastry finishes the bite with a slow waltz of flavor. It’s perfect with a scoop of homemade vanilla ice cream but just as nice on its own, as far as I’m concerned. I may be a bit jaded but my aunt’s original recipe is blue ribbon worthy – the best strawberry rhubarb pie recipe ever. I’m a little strange when it comes to strawberry pie because I like it to be a little runny and a little juicy. I’ve seen tons and tons of information on how to keep them from spreading and seeping when you cut into the pie but for me that’s part of the goodness of it all. If you want a firmer pie add about a teaspoon more of the quick cooking tapioca and let it cool completely before serving. I think you lose a little in the flavor when it’s served cold so if you’ve refrigerated it let it warm up a little or pop it in the microwave for a few seconds before serving. Rhubarb looks like bright red celery. It’s an ingredient that a lot of people aren’t familiar with so here are some tips on buying and preparing rhubarb to ensure that you get the best results! If you’re buying rhubarb in the store the leaves will probably be removed. Sometimes they’re left on when it’s sold at farmstands and farmers’ markets. Be sure to remove the leaves and discard them. The leaves are poisonous if they are eaten. Choose bright red, plump stalks with no obvious bruises or bad spots. The redder the stalk the sweeter the rhubarb. One pound of rhubarb is equal to about 3 cups sliced. Like celery, rhubarb sometimes has tough strings running through it. You can remove them just like you do with celery. If the rhubarb is young and tender you don’t need to worry about it. Store fresh rhubarb in the refrigerator as it wilts pretty quickly. Rhubarb is not generally available all year. You can freeze fresh rhubarb easily, though, so that you can have it any time. Use it in stewed rhubarb, strawberry rhubarb pie, rhubarb crisp… you name it. Slice it in 1/2-inch slices. Blanch in rapidly boiling water for 1 minute. Drain quickly and plunge into a bowl of ice water. Leave in the ice bath for 2 minutes, stirring occasionally. Drain well and pat dry. Flash freeze in a single layer on a cookie sheet. When solidly frozen remove the pieces of rhubarb to a freezer container. Rhubarb keeps in the freezer about a year. Thaw it in a colander before baking with it. A lot of people ask me about the various baking dishes I use. I really love baking in glass. I think the flavor is better (could be my imagination), the crusts are more golden, and the baking more even. I use vintage Corningware and Pyrex pie plates in a 9 or 10-inch size. Do you love an old fashioned, country look as much as I do? If so you need a couple of these ceramic pie birds! They vent the steam out of the pie and are SO CUTE! The beautiful crimson filling is a perfect balance of sweet and tart. 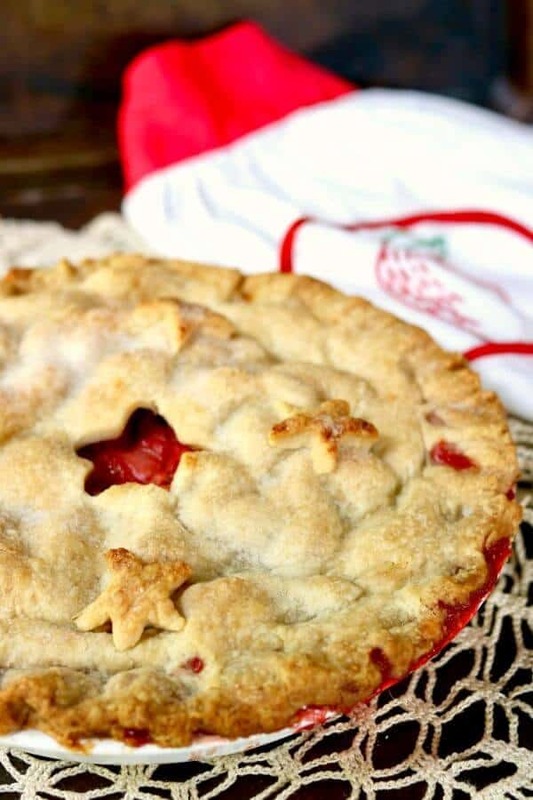 Covered in your favorite pie crust this strawberry rhubarb pie is an old fashioned treat. Mix the tapioca with the salt, light brown and granulated sugars until well blended. Add the prepared strawberries and rhubarb to the sugar mixture and toss gently until completely coated. Stir the vanilla into the strawberry mixture. Fit the pie dough into a 9-inch pie plate. Fill with the strawberry mixture. Cover with the other half of the dough, crimping the edges together. Cut vents in the top crust to allow the steam to escape. Brush pastry with milk and sprinkle with sugar. Place on a cookie sheet to catch the drips the place the whole thing in the oven. Reduce heat to 350F and cook for 45 to 55 minutes more, or until the crust is golden brown and the filling is bubbly. 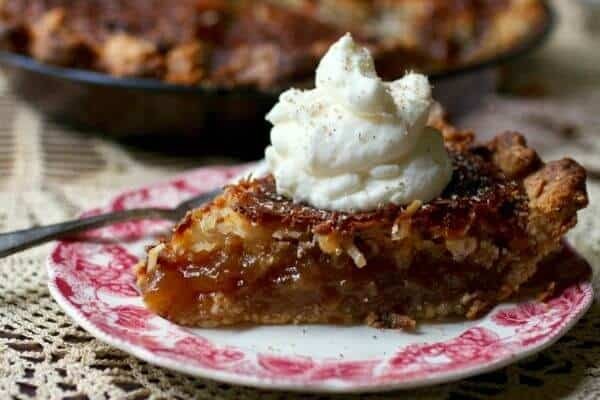 From left to right: pecan pie, candy apple pie, coconut pie – Click on the image to see the recipe.